Get to know the softer side of your favorite fairy tale baddies as they return home from a full day of scheming to enjoy a yummy dinner together and help one another get ready for bed. Wolves, today was not so good. You didn’t catch Red Riding Hood. You huffed and puffed without success. But brush your fangs, please, nonetheless. Wicked witches. Evil queens. And big, bad wolves. By day they’re such baddies! But cozy at night at home among friends? Why, they couldn’t be nicer! Inspired by the mischief-makers from classic folk and fairy tales, this picture book shows that even the baddest baddies can have big hearts. Deborah Underwood is the author of numerous books for kids, including Interstellar Cinderella and the New York Times bestsellers The Quiet Book, The Loud Book, and Here Comes the Easter Cat. 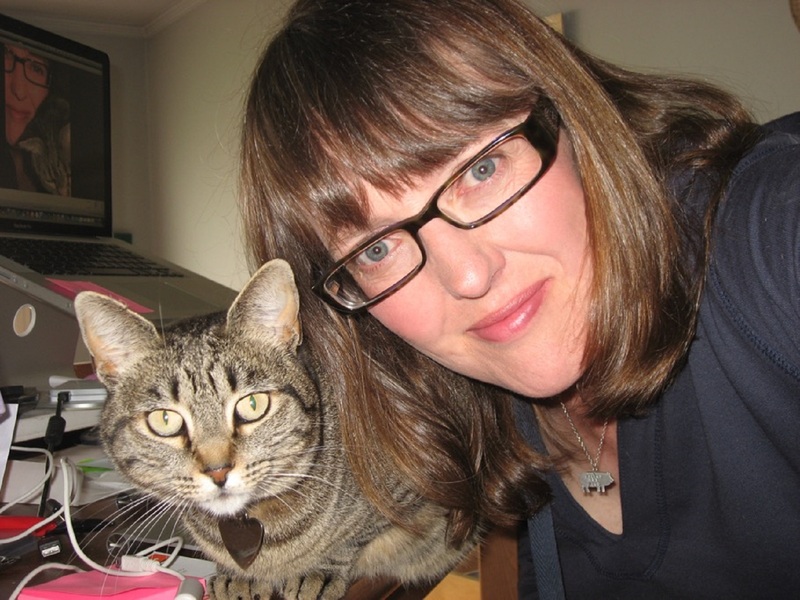 She lives in Northern California with her feline muse, Bella. Please visit her online at DeborahUnderwoodBooks.com. Juli Kangas grew up in Kansas City. After graduating from Kansas University, she worked for several years as a designer for Hallmark Cards, Inc., right there in her hometown. She then lived for four years in The Netherlands, where she began her freelance career, and enjoyed traveling around Europe, especially seeking out any opportunity to explore medieval villages and castles. The next phase was settling in Texas with two children to raise. She continued as a freelance illustrator, and her work included the children’s books Photographer Mole, Theodore, and A Child’s Book of Prayers. She also wrote and illustrated The Surprise Visitor. It is easy to determine what monsters and villains in typical fairy tales are up to during the day. But what do they do at night? Do they get a chance to relax? This tale describes what witches, dragons, and trolls do when it is time to get ready for bed. The text and the lush illustrations show monsters, dragons, and even Rumpelstiltskin getting ready for bed and reading bedtime stories. There is even a giant checking under his bed for princesses. (They are so scary, you know!) This work is a subtle reminder that in life, we are all more alike than we are different. Kids will get a lot of giggles from seeing some familiar monsters in a more humanized way. Underwood’s verse and Kangas’s charming, expressive watercolor with oil wash artwork set just the right tone. 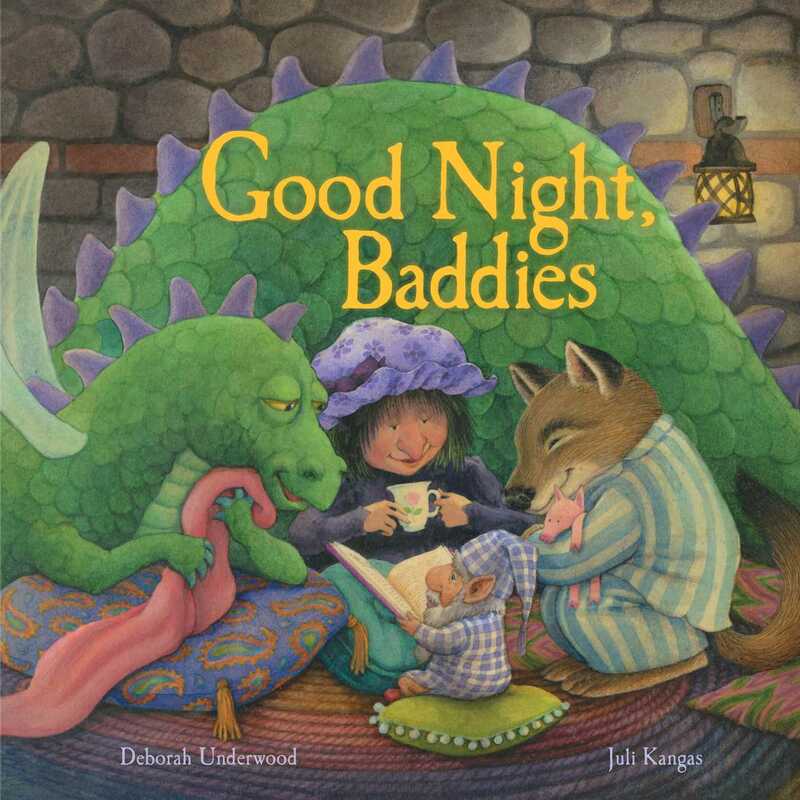 “Underneath a starry sky,/sing a baddie lullaby./Day will bring more evil schemes./Good night, baddies.../sour dreams!” This title is a terrific way to introduce fairy tales and can be used to talk about the importance of reading. VERDICT A thoroughly enjoyable offering that teachers and parents will have fun reading with children, especially at bedtime. From the title page, where the Big Bad Wolf shows all of his sharp teeth in an enormous yawn outside of the Three Little Pigs’ house, we see that this is clearly a different perspective on some of the meanest characters around. A very fatigued looking giant lumbers after Jack, and witches, wolves, and others make their way to a bat-bedecked castle at sunset: “Queen and dragon, troll and gnome: / tired baddies head for home.” We see them sitting companionably around a dinner table passing food to each other and looking happy to be together. Then it’s time to get ready for bed: while a wolf in striped pajamas squeezes toothpaste onto his toothbrush, the text says: “Wolves, today was not so good. / You didn’t catch Red Riding Hood. / You huffed and puffed without success. / But brush your fangs, please, nonetheless.” Underwood’s rhyming text keeps extending the story in creative ways, describing a giant who’s scared that a princess may be hiding under his bed, for example, and a dragon and wolf who “sing a baddie lullaby.” With illustrations filling each large page, Kangas uses an unusual technique of watercolors with oil washes to create vibrant colors with a lot of depth. The baddie castle looks like a cozy place, especially with such caring friends, and the story may give children a new perspective on viewing others. After a full day of scaring, all the bad guys from various fairy and folk tales head home to bed. The "baddies" meet each other at the castle they all call home, trading notes on how their days went and finally having a chance to "chat and smile." These aren't the evil versions we know from traditional stories; instead, these villains are quite pleasant. Some baddies pertain to specific stories, while others are generic witches and dragons. The rhyming text combined with illustrations that allude to classic tales calls to mind Janet and Allan Ahlberg's Each Peach Pear Plum. One drawback is that younger children who will love the bouncing rhythm and sweetly-drawn characters may not have been exposed to all of the tales referred to in this story, leading to confusion, while older readers might be turned off by what is essentially a going-to-bed book. Still, the rhymes and full-spread illustrations make this a near-perfect read aloud for the right audience.